ये स्वीडन , स्विजरलैंड या यूरोप का नहीं बल्कि भारत का चित्र है मुंबई-गोवा राष्ट्रीय महामार्ग NH66 कशेडी घाट मेरा देश बदल रहा है , ….! राष्ट्र नायक मोदीजी को धन्यवाद (This is not Sweden, Switzerland or Europe but India. Mumbai-Goa National Highway NH66 Kashedi Ghat. Mera Desh Badal Raha Hai- Thank you to nation builder Modi ji- translated). A photograph of a magnificent looking road has been shared on social media with the claim that it is the outcome of the developmental efforts of the Modi government. The above message has been posted on the Facebook group RSS and has been shared over 700 times so far. The same photograph has been posted with a slightly altered narrative which reads, “उत्तर के एक्सप्रेस वे ओर पूर्वोत्तर के डबलडेकर पुलों के बाद अब पश्चिम भारत मुंबई-गोवा NH66 कशेडी घाट !! बताने की जरूरत नही है किसने किया …क्यो की वो तो यही कहेंगे मोदी ने क्या किया है” (After expressways of the north and double-decker bridges of the east, now the western India Mumbai-Goa NH66 Kashedi Ghat!! Needless to state who did this…because they will keep saying what has Modi done- translated). Apart from groups on Facebook such as Vote For BJP, Sangha Mitra and Namo Fan, Alt News found that this image has been shared mostly by individual users on Facebook and Twitter. Alt News used the Google reverse image search tool and found that the photo does not represent any road in India. It is from Turkey. 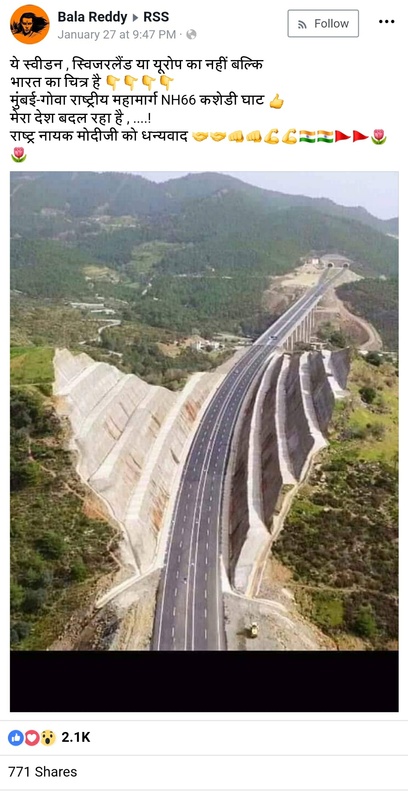 The photograph is of the Mersin-Antalya highway. Mersin and Antalya are cities dotting the Mediterranean coast of Turkey. The video posted below shows this highway passed off as National Highway 66 from Mumbai to Goa. This is an oft-used tactic for showcasing Modi government in positive light vis-à-vis infrastructural development. Earlier, a photo of a newly constructed road in Indonesia was shared as road development by the Central government.